The Bay RMP holds an annual meeting every year in the fall. The meeting showcases RMP highlights and various program updates. Sign up to receive occasional RMP news, updates, and publications. Estuary News, a publication of the San Francisco Estuary Partnership, has been reporting San Francisco Bay, Delta and watershed news for over 25 years, and won an award for excellence in 2011. Contaminant Data Display and Download Tool or CD3 is the primary tool for accessing and downloading the San Francisco Bay Regional Monitoring Program’s (RMP) long-term dataset and other project data stored in SFEI's Regional Data Center (RDC). The purpose of The Pulse is to make the most important information available on water quality in the Bay accessible to water quality managers, decision-makers, scientists, and the public. The Regional Monitoring Program for Water Quality in San Francisco Bay (RMP) is SFEI’s largest program. It provides the information that regulators and decision-makers need to manage the Bay effectively. The RMP is an innovative collaborative effort between SFEI, the Regional Water Quality Control Board, and the regulated discharger community. The RMP has combined shared financial support, direction, and participation by regulatory agencies and the regulated community in a model of collective responsibility. The RMP has established a climate of cooperation and a commitment to participation among a wide range of regulators, dischargers, industry representatives, non-governmental agencies, and scientists. The RMP provides an open forum for interested parties to discuss contaminant issues facing the Bay. Stable funding has enabled the RMP to develop long-term plans. In addition, Special Studies provide an opportunity to adapt to changing management priorities and advances in scientific understanding. RMP committees and workgroups meet regularly to keep the Program efficient, focused on the highest priority issues, and to ensure that RMP science is sound. The RMP has continually improved since its inception in 1993. The RMP has produced a world-class dataset on estuarine contaminants. Monitoring performed in the RMP determines spatial patterns and long-term trends in contamination through sampling of water, sediment, bivalves, bird eggs, and fish, and evaluates toxic effects on sensitive organisms and chemical loading to the Bay. The Program combines RMP data with data from other sources to provide for comprehensive assessment of chemical contamination in the Bay. The RMP provides information targeted at the highest priority questions faced by managers of the Bay. The RMP produces the Annual Monitoring Results which document the activities of the program each year, a summary report (Pulse of The Bay), technical reports that document specific studies and synthesize information from diverse sources, and journal publications that disseminate RMP results to the world’s scientific community. 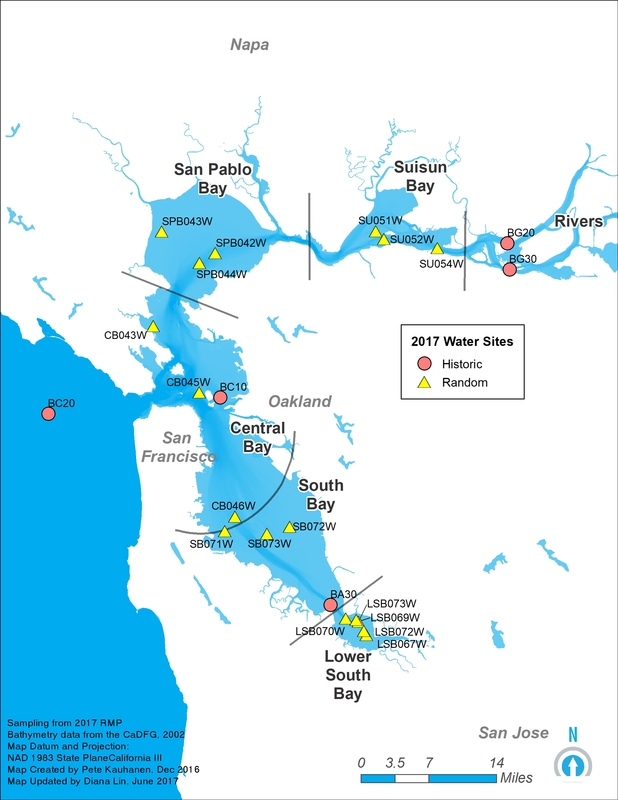 The RMP website provides access to RMP data, information products, and links to other sources of information about water quality in San Francisco Bay. Focus areas covered by the RMP are primarily addressed by the six workgroups: Emerging Contaminants (ECWG); Exposure and Effects (EEWG); Sources, Pathways and Loadings (SPLWG); PCBs; Selenium; and Dioxin. Workgroups consist of scientists who are currently studying the Bay, invited scientists who are nationally recognized experts in their field, and federal and state regulators. Each workgroup meets one to three times a year to address issues concerning the planning and implementation of RMP Special Studies and relevant elements of Status and Trends monitoring. RMP "strategy teams" provide a forum for focus on specific interests to the program. The strategy teams are composed of stakeholder groups, which meet as needed to develop long-term RMP study plans for addressing high priority topics. To date, the RMP has developed strategies pertaining to mercury, PCBs, dioxins, small tributary loads, forecasting, and sport fish. The RMP also participates in the San Francisco Bay Nutrient Science and Management Strategy, which is developing the science needed for informed decisions about managing nutrient loads and maintaining beneficial uses within the Bay. Activities of the workgroups, and technical content of the program as a whole, are overseen by the Technical Review Committee. The Steering Committee determines the overall budget, allocates program funds, tracks progress, and provides direction to the Program from a manager's perspective. In 1997, the RMP underwent a 5-year program review which helped to develop a revised set of RMP objectives including a new objective: “Describe general sources and loading of contamination to the Estuary” (Bernstein and O’Connor, 1997). The goal was to create a functional connection between the RMP and efforts to identify, eliminate, and prevent sources of pollution that influence the Bay. Guided by the new objective, the Sources, Pathways, and Loading Workgroup (SPLWG) was formed in early 1999 to produce recommendations for collection, interpretation, and synthesis of data on general sources and loading of trace contaminants to the Estuary. The first SPLWG recommendations were described in the first “Technical Report of the Sources Pathways and Loadings Workgroup” (Davis et al., 1999). Since that time the SPLWG has continued to provide management context and technical review on a series of desktop and field studies that largely followed the recommendations of Davis et al. (1999). The SPLWG ensures that the projects and products are relevant and help to answer ever developing management questions in the context of TMDLs and attainment of water quality standards. In addition to it's other work, the SPLWG also oversees the Small Tributaries Loading Strategy (STLS) project. The STLS focuses on loadings from small tributaries (the rivers, creeks, and storm drains that enter the Bay downstream of Chipps Island), in coordination with the Municipal Regional Permit for Stormwater (MRP). For further information, please contact Lester McKee at: ph 510-746-7363 or [email protected]. The Bay RMP fills critical science needs to assist managers in their goal of reducing harmful emerging contaminants in the Bay. Emerging contaminants are not currently regulated or commonly monitored, yet may pose significant ecological or human health risks. A global leader in this field, the Bay RMP has developed an emerging contaminants strategy that guides decisions on monitoring and management. Early identification of problem pollutants and quick action to prevent their spread is an optimal and cost-effective strategy for protecting water quality. This is especially true in an ecosystem like the Bay, which can act as a long-term trap for persistent contaminants, with recovery taking decades or centuries when contamination is extensive. PFOS, PFOA, and other poly- and perfluoroalkyl substances (PFAS) are a particular focus of the RMP, and the subject of a recently completed synthesis and strategy document. Flame retardants known as PBDEs were once moderate concerns for the Bay, but bans and phase-outs reduced contamination to levels of low concern. Many other contaminants have been monitored in the Bay and found to be of low concern as well. A multitude of emerging contaminants fall into a final category of possible concern, where uncertainty in our knowledge of toxicity prevents an evaluation of risk. See the RMP's CEC Strategy (2017 Revision), the 2018 Strategy Update, the 2013 Pulse of the Bay and other Bay RMP resources on emerging contaminants for more information. For further information, please contact Rebecca Sutton at: ph 510-746-7388 or [email protected]. PCBs are a pollutant of high concern in San Francisco Bay. Additionally, the bay was placed on the State of California’s 303(d) list of impaired waterways in 1998 as a result of elevated concentrations of dioxins and furans (commonly referred to as only ‘dioxin’) in fish.The PCB & Dioxin strategy ensures that the RMP is providing the information needed to support the development of appropriate effluent limits for municipal and industrial discharges and find remedies to the Bay’s PCB problem. The upcoming management decisions include the next iteration (2019-2020) of the PCB TMDL and identifying the best options for management actions to reduce PCB impairment. Our understanding of dioxin in the Bay has improved due to special studies conducted over the past decade. Although the available information suggests progress will be slow toward Bay-wide reductions in concentrations in fish and resulting health risks to humans and wildlife, similar to PCBs, there may be localized opportunities to effect change at select, more highly impacted, sites. The first Selenium Strategy Team meeting will be held at SFEI on Tuesday, April 22 from 10 am to 2 pm. For more information, please contact Jennifer Sun at: ph 510-746-7393 or [email protected]. At the request of the Regional Board, the RMP expanded the biological effects portion of the Status and Trends program, which at the time only monitored for aquatic and sediment toxicity. The Exposure and Effects Workgroup (EEWG) was formed with members from SFEI, USGS, AMS, the Regional Board, and other interested stakeholders. One of the purposes of the workgroup was to develop a biological effects pilot study (the Exposure and Effects Pilot Study (EEPS)) that would help address beneficial use management questions developed by the Regional Board. By building on the recommendations of other effects workgroups, reviewing existing literature related to work in the Estuary, and soliciting recommendations from the local scientific community (through a survey) the workgroup designed a five-year plan for addressing biological effects in the Bay. The RMP’s EEPS evaluated a balanced suite of contaminant exposure and effects indicators that respond to general and specific contamination at the biochemical, cellular, individual, population, and community level. It evaluated contaminant effects and exposure in different media (on the bay floor, in the water column, and in wetlands/estuary margins), and at different spatial scales (site-specific, regionally, and estuary-wide). These initial overarching principles incorporate recommendations of the EEWG. At the end of the five year pilot study the workgroup was incorporated into the RMP as a permanent workgroup. The EEWG continues to address the biological effects portion of the Status and Trends program and Pilot and Special Studies. For further information, please contact Jay Davis at: ph 510-746-7368 or [email protected]. Sediment is a critical water quality parameter for the Bay. Sediment transport is a major factor in the fate and transport of priority pollutants such as PCBs and mercury. Suspended sediment concentrations in the water are also important for preventing large algae blooms despite high nutrient concentrations. The RMP has been studying sediment since the Program began in 1993. In recent years, sea level rise has heightened the interest in sediment supply to the Bay. The mass balance of sediment in the Bay is a critical factor for marshes and other shoreline habitats to be able to withstand the rising seas. As the San Francisco Bay Restoration Authority decides how to spend $500 million for habitat restoration, it is critical to know how much sediment will be available and where. In 2018, the RMP created a new Sediment Workgroup to bring together key stakeholders and scientists studying this issue and to prioritize science studies to inform management decisions. There are currently no scientific advisors for the Bay RMP Sediment Strategy Workgroup. For more information, please contact Scott Dusterhoff at: ph 510-746-7350 or [email protected]. Findings from a screening-level RMP study of microplastic pollution in our Bay show widespread contamination at levels greater than other U.S. water bodies with high levels of urban development, the Great Lakes and Chesapeake Bay. Wildlife consume microplastic particles; ingestion can lead to physical harm, and can expose aquatic organisms to chemical pollutants in the plastic. Kara Lavender Law, Sea Education Association, Inc.
For further information, please contact Meg Sedlak at: ph 510-746-7311 or [email protected]. This archive contains important documents relating to the establishment and development of the RMP. Flegal et al. 1991. Trace Element Cycles in the San Francisco Bay Estuary: Results from a Preliminary Study in 1989-1990 Taberski et al. 1992. San Francisco Bay Pilot Regional Monitoring Program 1991-1992: Summary Progress Report. SFEI. 1994. 1993 Annual Report: San Francisco Estuary Regional Monitoring Program for Trace Substances. SFBRWQCB. 1995. Contaminant Levels in Fish Tissue from San Francisco Bay. Johnston. 1995. Regional Monitoring Program Update. Regional Monitoring News Article. 2004. Founder Steve Ritchie Looks Back at Ten Years of the Regional Monitoring Program. Meadows. 2013. Celebrating 20 Years of Monitoring San Francisco Bay. Fish from San Francisco Bay contain concentrations of mercury, PCBs, and other chemical contaminants that are above thresholds of concern for human health. This problem was first documented in 1994 when the San Francisco Bay Regional Water Quality Control Board (SFBRWQCB) performed a pilot study to measure contaminant concentrations in Bay sport fish (Fairey et al. 1997). Trowbridge P. 2018 Bay RMP Multi-Year Plan. Richmond, CA: San Francisco Estuary Institute ; 2018 . Report No. : 860. Yee D, Franz A, Wong A, Trowbridge P. 2018 Quality Assurance Program Plan for the Regional Monitoring Program for Water Quality in San Francisco Bay. Richmond, CA: San Francisco Estuary Institute ; 2018 . Report No. : 890. Trowbridge P. Status & Trends Monitoring Design: 2018 Update. Richmond, CA: San Francisco Estuary Institute ; 2018 . Trowbridge P. 2018 RMP Detailed Workplan and Budget. Richmond, CA: San Francisco Estuary Institute ; 2017 . Trowbridge P. Charter: Regional Monitoring Program for Water Quality in San Francisco Bay. Richmond, CA: San Francisco Estuary Institute ; 2017 . Report No. : 844. Gillet DJ, Parks AN, Bay SM. Calibration of the Multivariate AZTI Marine Biotic Index (M-AMBI) for Potential Inclusion into California Sediment Quality Objective Assessments in San Francisco Bay. Richmond, CA: San Francisco Estuary Institute; 2019 . Report No. : 939. Yee D, Wong A. Evaluation of PCB Concentrations, Masses, and Movement from Dredged Areas in San Francisco Bay. Richmond, CA: San Francisco Estuary Institute; 2019 . Report No. : 938. Yee D. 2017 RMP Bay Margins Sediment Samples Quality Assurance Report. Richmond, CA: San Francisco Estuary Institute; 2018 . Yee D. 2017 RMP Water Samples Quality Assurance Report. Richmond, CA: San Francisco Estuary Institute; 2018 . Shimabuku I. 2017 Update to Cyanide Rolling Average. 2018. 2017 Water Cruise - Copper and Cyanide Sampling Map. 2018. Salop P, Shimabuku I, Davis J, Franz A. 2018 Bivalve Retrieval Cruise Report. Richmond, CA: San Francisco Estuary Institute ; 2018 . Report No. : 920. Davis J. 2018 Regional Monitoring Program Update. Richmond, CA: San Francisco Estuary Institute ; 2018 . Report No. : 906. Trowbridge P, Wong A, Davis J, Ackerman J. 2018 RMP Bird Egg Monitoring Sampling and Analysis Plan. Richmond, CA: San Francisco Estuary Institute; 2018 . Report No. : 891. Shimabuku I, Trowbridge P, Salop P. 2018 RMP Bivalve Deployment Cruise Plan. Richmond, CA: San Francisco Estuary Institute; 2018 . Report No. : 892. Salop P. 2018 RMP Bivalve Deployment Cruise Report. Richmond, CA: San Francisco Estuary Institute ; 2018 . Report No. : 903. Shimabuku I, Trowbridge P, Salop P, Franz A. 2018 RMP Bivalve Retrieval Cruise Plan. Richmond, CA: San Francisco Estuary Institute ; 2018 . Report No. : 893.